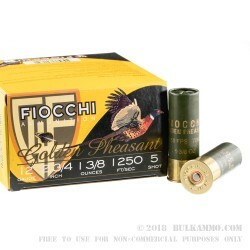 This 12 Gauge shotshell from Fiocchi’s Golden Pheasant line of ammunition is loaded with 1 ⅜ ounces of #5 shot. 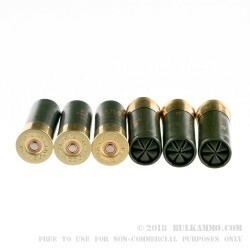 Each pellet in this shell sports a full nickel plating, making them substantially harder, so they will not only resist deformation and stay round while traveling through the barrel to give you tight, consistent patterns, but also penetrate coarse feathers and the scrubby vegetation that pheasant like to take cover behind. 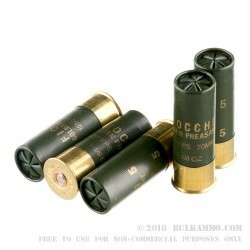 #5 shot is versatile, and despite the bird depicted on these shells’ packaging you’ll be able to bag grouse, rabbit, squirrel, and even rugged toms with this shell as well. 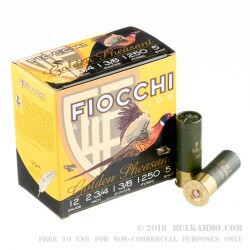 Fiocchi’s over 140 years of experience manufacturing premium ammunition imparts a lot of benefits to a hunter. Their consistent 209 primers, hearty resin wads, durable American made shells, and double-based shotshell powders combine to make a shell that’s certain to satisfy in any conditions.